I always figured that riding a bike with a girl in tow was a romantic gesture. It’s a common image in anime at least. 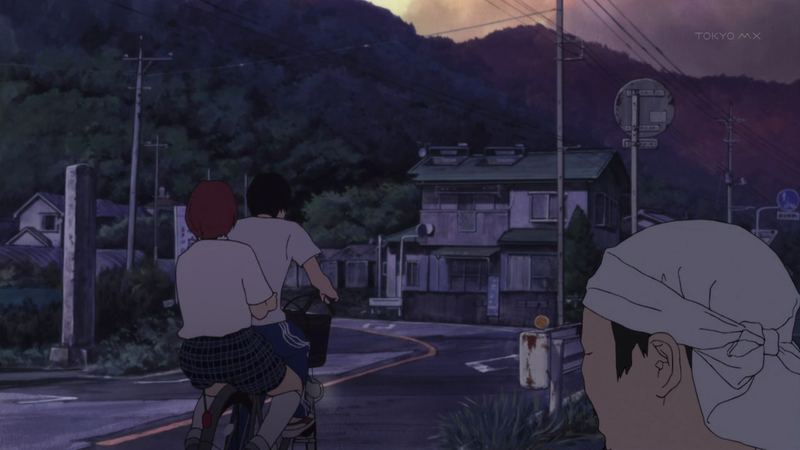 A boy riding his bike with a girl clutching onto him from the back as they ride off into the sunset. Ah, what a refreshing image of youth and love. But you will find no such image of youth and love in this series. All you will find is despair and unease. 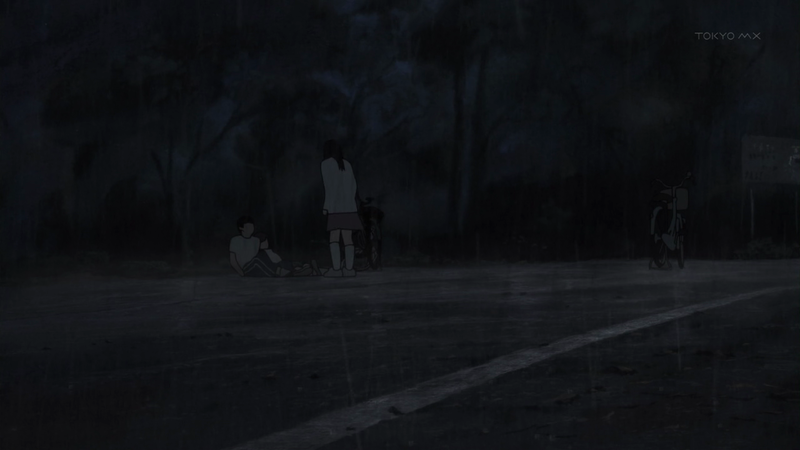 And that’s what Takao and Nakamura’s bike ride is all about: their attempt to escape from a town where they are deemed outcasts. Even with Nakamura’s usual foul mouth, the ride is somewhat poignant, as the two muse about what lies beyond the hills surrounding their town. It’s a surprisingly deep conversation that I wasn’t expecting, but it was a little sad to see these two unable to cope with their surroundings. I live in a small town too. Most people drive by it on the freeway without even realizing that they had passed it. Whenever people ask me where I’m from, I usually respond with some broad response like “I’m from the East Bay” just to make it sound more exciting. 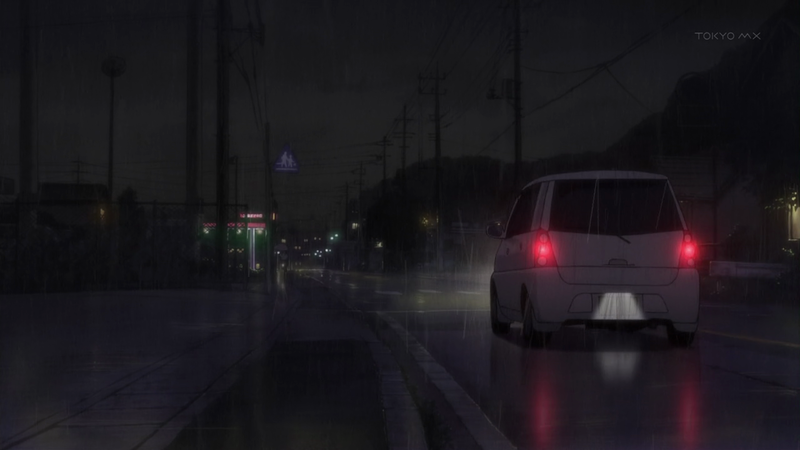 In truth, my town is as sleepy and dull as the town in Aku no Hana. Nothing exciting really happens out here in the suburbs. And for the longest time until I was out of high school, this was my entire world. At some point in our lives, everyone wants to see what is “beyond the hills” and see more of the world. I think all humans are driven by loneliness to seek out people we can find comfort in, even if it means leaving what we call home. From up high, everything looks a little smaller. Climbing the mountain shows Nakamura just how small her town is and how insignificant it must be in the world. After all, she wasn’t able to find happiness in such a place. Where in the world is there a place for two deviants such as herself and Takao? The answer to that, she believes, lies beyond the scope of her vision, someplace outside of her town. I think my greatest worries came true the moment Saeki chased after them. I’ve been getting a strong jealousy vibe from her, since she keeps suspecting Nakamura of being too close to Takao. It’s one messed-up love triangle, for sure. Just like an abused spouse in denial, she comes back to Takao and tries to take him back. The craziest part of it all was that she was apologizing to him, not the other way around. She blames herself for what’s happened, but it all too willing to start over with Takao if he leaves Nakamura. That’s Nakamura’s cue to strip Takao naked, right in front of Saeki. 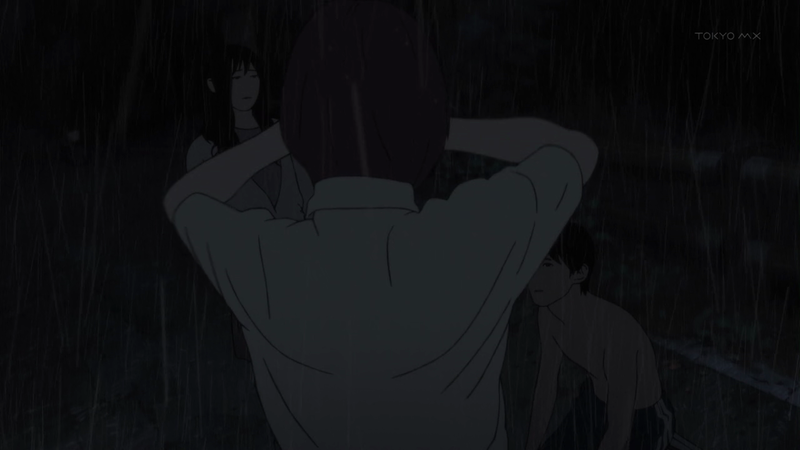 It’s such a striking metaphor of how humiliated Takao is, and how she is literally stripping away the lies to bare the truth to Saeki. Takao has no words for either of them because it’s the harsh truth. “They stick to his body behind the walls that hide his true self.” And this right here is his true self: cowering, weak, and shameful. So much for pure little Saeki-san, the muse of Takao’s dreams. I’m starting to think that she’s on the yandere route. Her definition of love already seems really twisted. If someone you hardly knew stole your gym clothes and lied about it, would you chalk it up as a sign of devotion and love to you? I would hope not, dear reader. In the end, Nakamura was probably right. Saeki is just as shallow and just as twisted as everyone else. 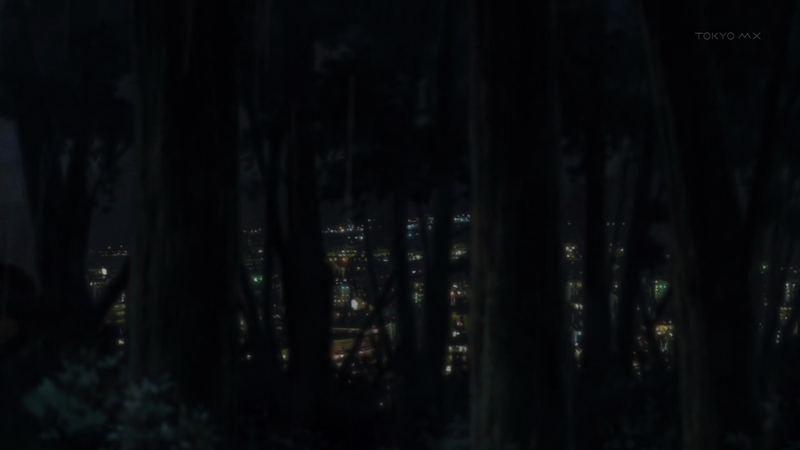 It’s up on that hill that Takao is unable to choose between Nakamura and Saeki. What should’ve been an easy decision has now become muddled. Nakamura now seems more sympathetic as a misunderstood girl who wants to go somewhere far away while Saeki just seems like an overly possessive proto-yandere who wants to take him back to their dull town. Unable to choose, he’s now driven away the two people closest to him. “Kasuga made me sparkle!” Girl, this ain’t no shoujo.